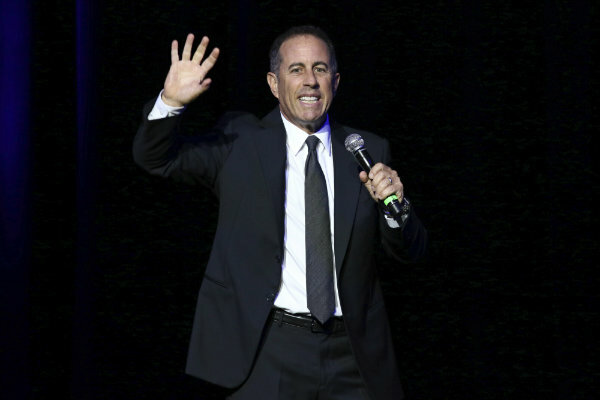 As "Comedians in Cars Getting Coffee" cruises into its tenth season, Jerry Seinfeld realizes that with great success also comes the potential for lawsuits. He experienced it with the "Seinfeld" television series, his animated turn in "Bee Movie," and now with his latest show. The lawsuit comes from Christian Charles, who claims he developed the concept, and is therefore the owner of the project. Charles directed the first episode of the series. Seinfeld says he's not worried, though he's a little hurt that the lawsuit comes from a friend. Earlier in the week, the comedian sat down with The Associated Press to talk his favorite moments from "Comedians in Cars Getting Coffee" (the new season debuts July 6 on Netflix), whether it's open season on comedians after politically polarizing incidents involving stars ranging from Samantha Bee to Kathy Griffin, and why you won't hear about his political views. Q: Do you feel comedians are under attack these days? Seinfeld: Not really, because there's so many voices that they are kind of canceling each other out. It seems to me that every single person everywhere is under attack in their comments section of whatever they think or whatever they said. ... To me it has no impact because there's too many, too much noise. It's all just noise that just drowns - everybody drowns each other out. Q: It used to be that comedy was an escape. Seinfeld: It can still be that. My show, I don't do any political humor, only because I'm not good at it, and I just do stuff that I think is funny. And so, you have no idea what my politics are and I kind of like to be pure, that it's just about what I think is funny. Q: Tell me about the lawsuit filed against you? Seinfeld: I don't know if you remember my TV series; a friend of mine sued me for $100 million dollars that I took the whole idea from him. It's a guy who lives in Queens. ... When we did "Bee Movie," there was guy who said, "I was going to do a movie about bees, so you owe us everything." It's unfortunate when it's friend, and they decide to go for the money instead, and the friendship. That's not the nicest moment, but I'm used to it. Q: How did you get the idea for the show? Seinfeld: It really started when I was doing the show called "The Marriage Ref," which we came up with about 10, 11 years ago and it was celebrities trying to help regular people with their marriage. And so, we were shooting these things and we made a few of them. And I found that I could edit the conversation to make it funnier, that I could go into an edit and I could take 20 minutes of conversation and make it 20 minutes that was just OK and make it 10 minutes that was really funny. Q: So, it's the comedians more than the coffee and cars? Seinfeld: Yes. It was really talking to comedians and having them not feel like they have to get a laugh because they have a lot of interesting thoughts. Comedians have very strange minds. That's how they become comedians. And whenever there's an audience, our instinct is to play to that audience. But if you get them away from the audience, they come out with other things that are interesting, that I thought people would like to hear. Q: I think I know your favorite episode was — with then-President Barack Obama? Seinfeld: That was. Being outside the Oval office and knocking on the window, and like he's just some loser single guy, and I'm another loser single guy. It's like a Jerry and George scene where I'm going, "What's going on? I thought we were hanging out. Come on let's go." That was one of the most amazing moments of my life (and) he and the Secret Service allowed me to do that. Seinfeld: Having the last interview with Jerry Lewis before he passed and getting to talk to him about how he writes and, and ... how him and Stan Laurel worked together on a lot of his scripts. And, you know, to a comedy geek like me that's the ultimate, to talk to somebody like that. Q: What about the episode with Julia Louis-Dreyfus? Seinfeld: It was incredible, you know. ... I would never want to do like a conventional reunion-type episode. But for us to just sit together and talk, I think it's nicer for the public to see that than something that's really produced and performed.